The trailer for the art-house movie Youth depicts aging composer Fred Ballinger, who is trying to come to terms with his life and family. “You were right,” he says. “Music is all I understand, because you don’t need words and experience to understand it. It just IS.” This reviewer believes Fred’s insight is especially true for blues music. One doesn’t have to be Beethoven to play them, or opera diva Maria Callas to sing them. One need not be as poetic as Shakespeare to write them. The blues don’t require words and experience to comprehend. They simply ARE. Sacramento’s Val Starr is a Woman on a Mission to demonstrate this, along with her band the Blues Rocket. Her conversational, well-balanced vocals and thirteen original tracks are perfect for a medium-key outdoor concert. Screaming guitar may be absent, but melody is abundantly present. Even though some of the offerings on her third CD sound similar, they help listeners groove and relax. “The blues are many things to many people,” Val states in the album’s liner notes. “Woman on a Mission pays homage to the diversity and passion of the blues by showcasing a wide range of blues styles, from rockin’ blues to traditional shuffles and West-coast swings. This album also represents my desire to break out of the mold and follow my own blues heart.” In a music scene where covers rule, and original songs aren’t considered cool, Starr’s audacity is commendable. Helping Val to launch is the Blues Rocket band: co-producer John Ellis on bass and background vocals; Frankie Soul on lead guitar; and Paul Farman on drums. Starr herself performs on lead vocals and rhythm guitar. Special guests include drummers Guyle Taber and Rick Meyer; saxophonist Marty Deradoorian; Horacio Socarras on congas; and Todd Morgan on keyboards, electric piano, and organ. Track 02: “Bad Shoes Blues” – Smokin’ lead guitar from Frankie Soul kicks off this Chicago-style shuffle about foolish footwear. “All right, girls. I’m talking to you. You don’t want to end up with the Bad Shoes Blues. Listen up, ladies: when your feet start to swell, that’s the time you know you are in high-heel hell. They sure look pretty, yes, they do, but they just end up giving you the Bad Shoes Blues.” Unburden your aching ankles and go barefoot on the dance floor. Track 03: “The Boozin’ Blues” – Does drinking alcohol facilitate relationships, or do relationships facilitate drinking alcohol? In this case, the answer is “no” on both counts. “My baby’s always high,” Val laments, and then issues an ultimatum: “So stop your abusing, and if your damn boozing ain’t through, I’ll say goodbye.” This is tasty traditional blues, grilled medium-slow. Track 12: “The Blues is not a Color” – Starr takes a page from George Thorogood’s playbook, channeling “Bad to the Bone” on this penultimate track. With sweet sax from Marty Deradoorian and killer keys and piano by Todd Morgan, number twelve invites everyone to take a trip back to the 1950’s: “The b-b-b-blues are back inside, the b-b-b-blues are back inside of you!” For a closing number, it’s a swing-inspiring riot. 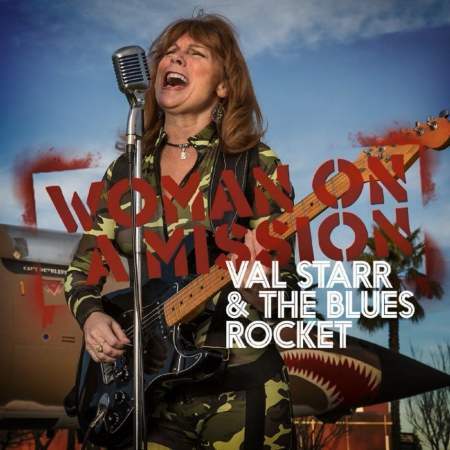 Val Starr is a Woman on a Mission to bring original blues to the forefront of the genre!